Smithtown, NY - June 30, 2014 - Suffolk County Legislator Robert Trotta recently attended the Girl Scouts of Suffolk County Council Gold Award Ceremony where several scouts from his district were presented with their Gold Award in recognition of completing their community projects. The Girl Scout Gold Award is the highest honor one can achieve in Girl Scouting. 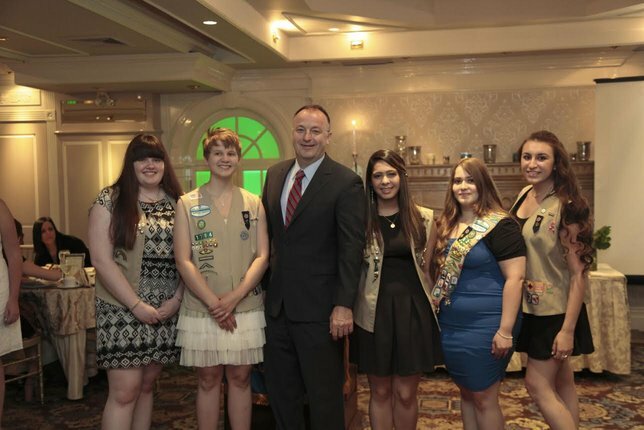 “The young women who earn this award exemplify the values of leadership, character and service that are inherent in Girl Scouts,” said Legislator Trotta. Pictured at the ceremony, from left to right, are Kathleen Nolan of Commack, Brittany Jaworski of Smithtown, Suffolk County Legislator Robert Trotta, Lauren DePinter and Amy Florio of East Northport, and Jaclyn Inzalaco of Smithtown. Subject: LongIsland.com - Your Name sent you Article details of "Legislator Trotta Congratulates Girl Scouts"